How the heck did Christmas sneak up so quickly!? I’ve been so busying being jet-lagging, baking, and merry making that I didn’t even notice that Christmas is in two days! What are your plans? 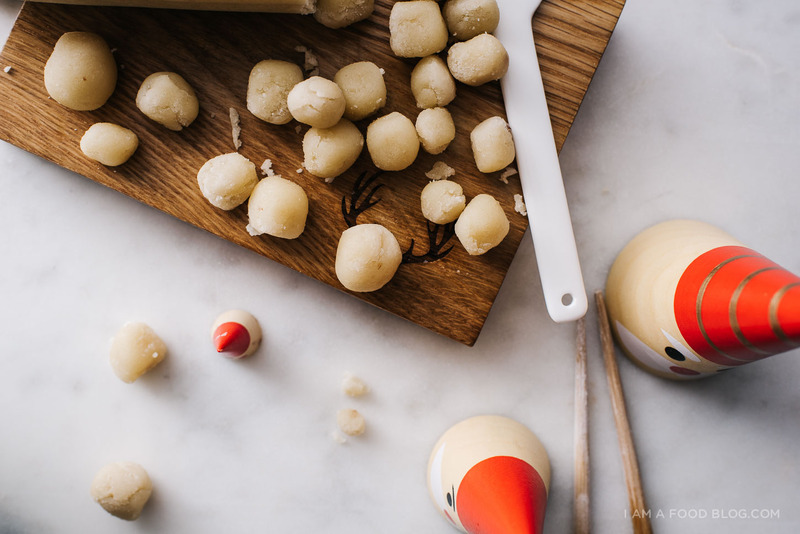 Mine involve a Christmas-y hot pot dinner with my family and a Mike and I collaborative Christmas day menu – I’m making a ducken (that’s a duck stuffed with a chicken) and he’s doing the sides. I’m super excited. 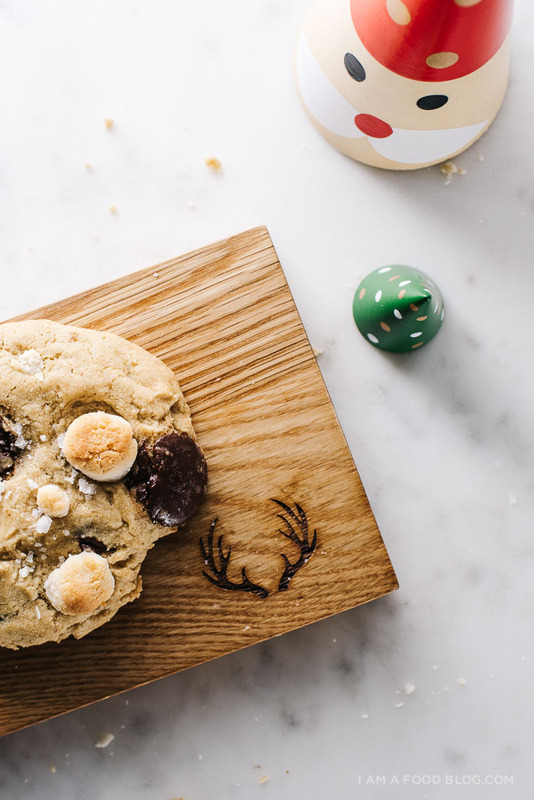 Of course, there will be cookies for dessert. 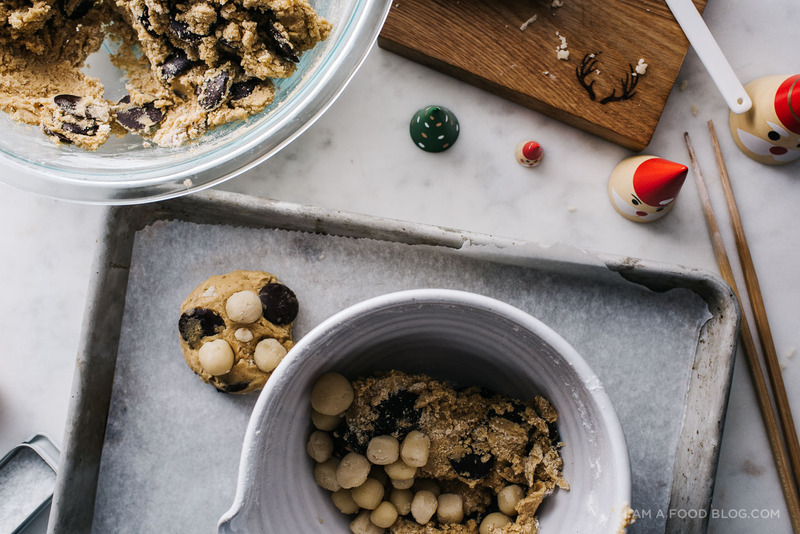 Cookies like these marzipan chocolate chip beauties. When Molly and Alana invited me along to a lil marzipan dance party, I knew I had to make cookies because you can definitely dance and eat cookies at the same time, especially these golden brown, crispy on the edges and perfectly gooey and soft in the middles cookies studded with chocolate and marzipan. Are you guys fans of marzipan? If you like almonds, then you’re a fan of marzipan even if you don’t know it. If you’re a big marzipan fan, you should totally go to Germany because they have marzipan EVERYTHING. I brought some back with me and it was soft and almond-y and basically a marzipan dream. Seriously, I had the best time in Berlin at the Christmas markets. They really know how to celebrate Christmas over there. And while they had loads of pretzels, wursts, steins, bethmännchen (traditional German marzipan cookies), what they didn’t have were chocolate chip cookies. 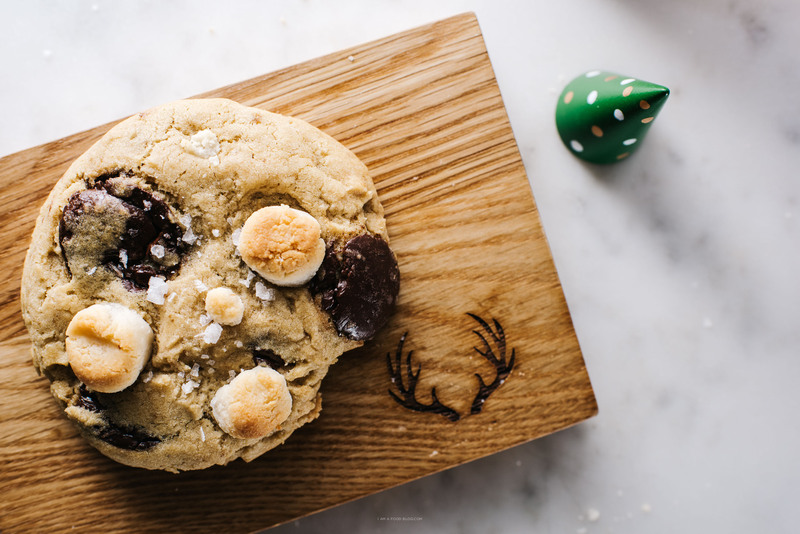 So this mash-up of a marzipan chocolate chip cookie is my little ode to Christmas in Germany. I riffed off of my all time favorite chocolate chip recipe by adding in marizpan balls. At first I stirred in the marzipan balls, but then I realized that you couldn’t really tell that the marzipan was in the cookies, so I started popping the balls on top. You can do either, but I ended up liking the ones where the marzipan was incorporated into the dough. 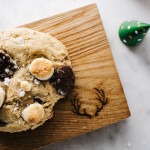 Some of my favorite people on the internet are in on this internet-wish-it-was-real-life marzipan party hosted by Alana and Molly: Michelle, Lily, Betty, and Beau all made some marzi-ful treats, so go on over and check them out. 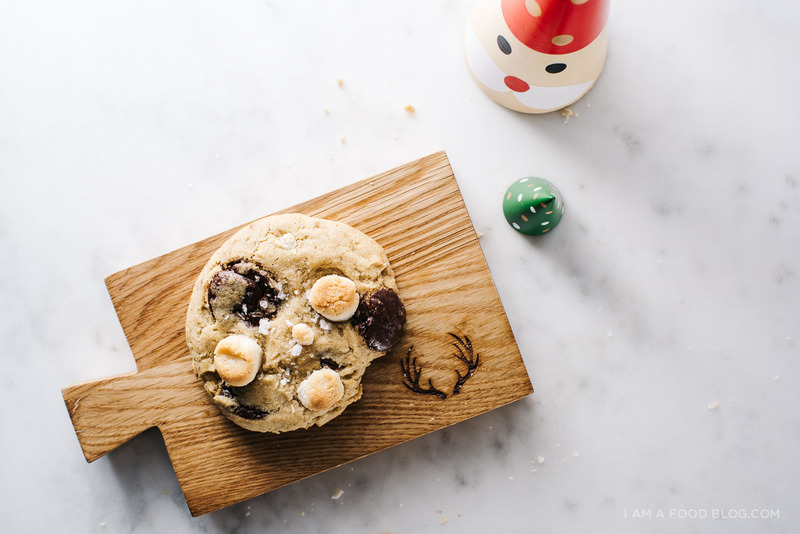 Wishing you a zen, relaxing, cookie-filled last 2 days before Christmas! Cream the butter and sugars until light and fluffy (5 minutes on medium speed if using a mixer). While the butter and sugar is creaming, whisk together the flour, baking soda and salt in a small bowl. Set aside. Add the egg and vanilla to the butter-sugar and mix until combined. Add the flour and mix, with a spatula, until barely combined. Fold in the chocolate and marzipan. Portion the cookies out onto a parchment paper lined cookie sheet. Sprinkle with the flaky salt and bake for 12 minutes, until the edges are golden but the centers are gooey. Let cool on the baking sheet for 5 minutes and enjoy warm! dude. this is a killer fusion. 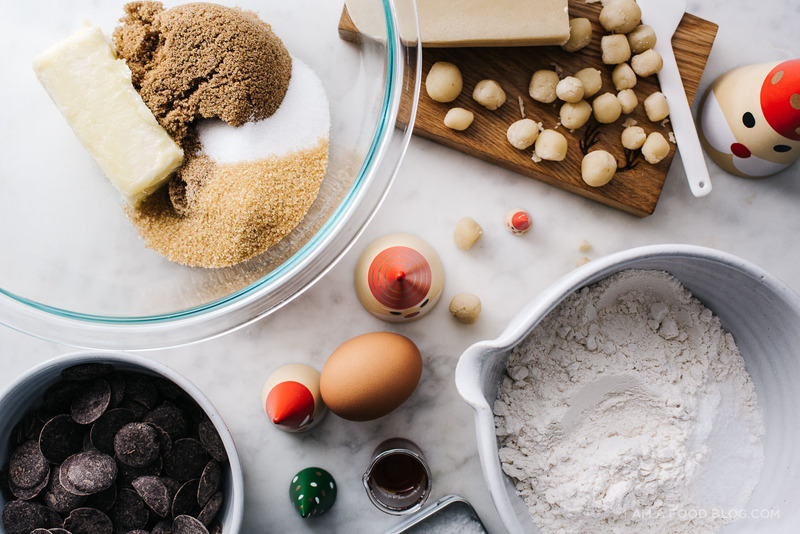 marzipan in chocolate chip cookies??? my mind is seriously blown right now. Marziful!! New favorite word! Gah these sound absolutely AMAZING. 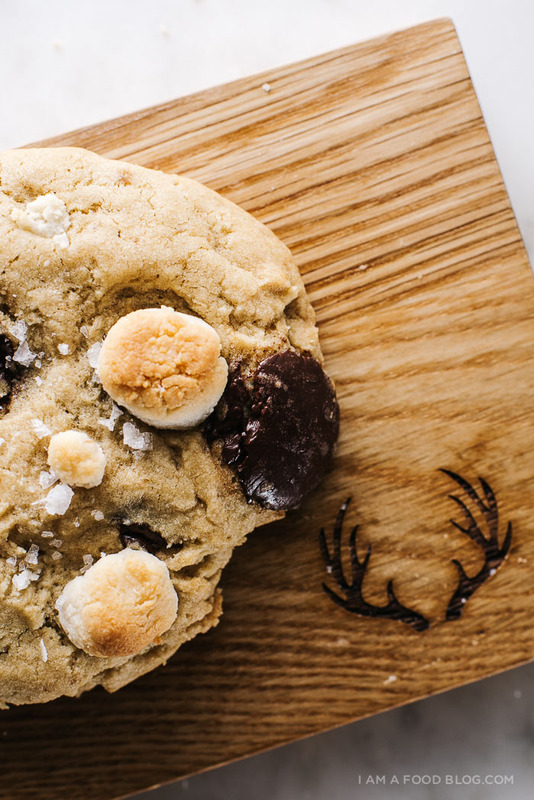 Marzipan and chocolate in cookie form? YES PLEASE. And I’ve never been to Germany, but I can only imagine how cute and cozy and festive those holiday markets are—and that marzipan sounds like an absolute dream. Hooray for #marzipankiki!! You and these are marzi-ful!!! I bet those Christmas markets were sooooo dreamy but were they as dreamy as these cookies with all their marzipan puffs? Huge hugs and happy Christmas to you and Mike!! 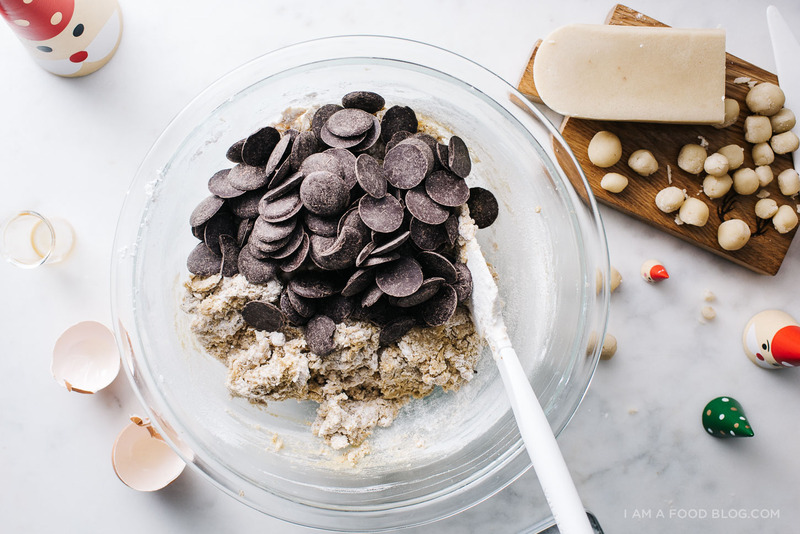 i love to eat cookies and in edition to i am fan of marzipan so these marzipan chocolate chip cookie are seems made for me only :) i am signing of and going to make this right now at home. Definitely going to Germany just for the Marzipan and then bringing some back to all of you sweet angel babies! This was so much fun, Steph! Is it dumb I’ve never even considered putting marzipan with chocolate stuff? But that’s like obvi a really amazing idea! It adds a bit of texture and caramel flavor. I haven’t tried without, but I’m guessing the texture may change a bit. Sometimes they have turbinado sugar in little packets at coffee shops. This is sneaky, but if you buy a coffee, you can ask if you can grab a couple? I think you’d need maybe 8-10 packets :) hope that helps! Hi Stephanie! I’m a new reader and have been loving your blog! What did you study in college – did you study anything related to food in college or was food a passion of yours on the side? You can never have too much cookies. I love that you used marzipan in these, such a special add-in, great! this is great, shows me ways to create delicious food will be going through your other good looking recipes.